Microfinanciers may soon have a new market in developing countries: aspiring cycling cell phone chargers. 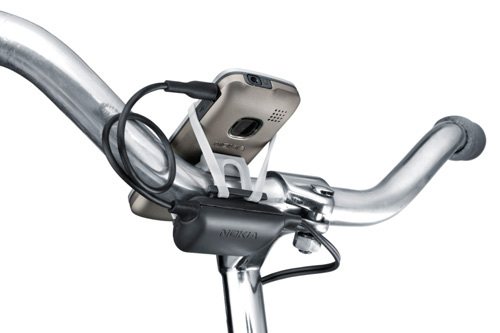 On Thursday, June 3, Nokia Oyj released a bicycle-powered phone charger, which charges your phone as you ride. The complete charge kit comes with a charger, a dynamo (a small electrical generator powered by the wheels’ motion ), and a holder to attach the charger to the bike. The charger starts working once the bike reaches 6 kilometers per hour, and stops at 50 kilometers per hour. Maximum output is achieved at 25 kilometers per hour, according to Nokia’s website. Nokia says the charger was designed for emerging markets in developing countries, where electricity is often scarce and unreliable. And as the Nokia blog points out, the bike-powered phone charger could provide a sustainable micro-business for entrepreneurial bikers in developing countries. 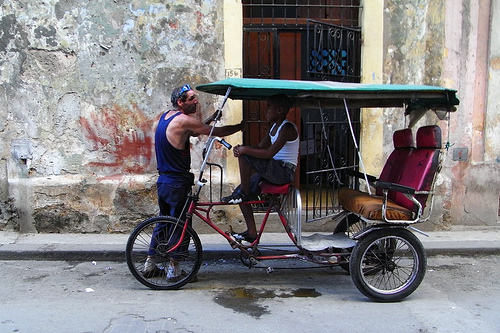 A "bicitaxi" sits idle in Havana, Cuba. The new bicycle-powered phone charger could provide extra business for bicitaxi riders. Photo via designwallah-flâneur. The kit will be available in blackout-plagued India by the end of the year, at a cost of approximately Rs850 (US$18.25). Maybe “charger-wallahs” will soon join chai-wallahs and auto-wallahs in the indispensable Indian lexicon.